Control frequently used Reason transport and mixer functions easily from your iPhone’s touch screen. Makes recording away from the computer a breeze! 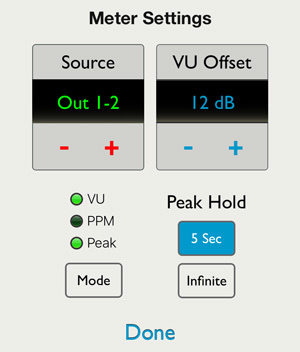 Access standard transport functions, toggle Loop and Metronome. Know where you're at with the timecode and bar-beat display. 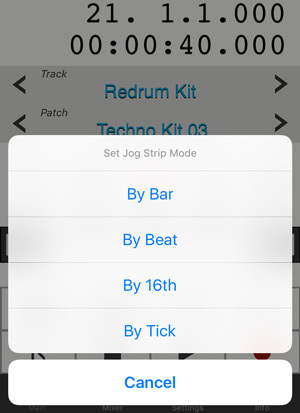 Slide your finger in the jog strip to navigate through your song. Set start and end points for Loop. Program up to five custom marker locations to quickly go to a song location. Step through sequencer tracks and their patches. Mute or solo a track. Undo or redo an action. Recording controls include Alt, Dub, enable record automation, and quantize recording. The Big Meter shows audio levels. You can select which of your soundcard inputs or outputs it displays. Edit individual Reason Main Mixer channel controls - level, pan and width. The level meter helps refine your mix. Mute or solo a channel. Adjust the Reason Main Mixer master level fader. Set precount bars, click audio level and adjust tempo. Double tap on the Big Meter on the Main screen and edit its settings. Set the precision of the jog strip navigation by double tapping on it.